Ma’am prompted us with her hands as she spoke; like a conductor to an orchestra. But to parrot someone as an adult is embarrassing so a few of us scratched our heads and, with an awkward soft-spoken mumble, trailed off in between. I was one of these people. Sitting at the back of the class, fiddling with pens and looking at the clock, I had no interest in the Italian language. But my father ran a business and dealt with Italy in various woods for furniture. He wanted me to learn Italian and work for the company. I was doing a Bachelor’s degree in Business Administration at the time, and though I could stand in front of a classroom with graphs and statistics projected on a screen, deliver lengthy presentations on market research and finance management, somehow I failed at counting from one to ten in Italian. But even Hindi and English abandoned me at the dinner table when I tried to tell my father about this failing interest. He was a hulking figure, his belly pressed against the table’s edge, and his upper-lip heavy with a thick handlebar moustache. He loved to eat, and I, under the tutelage of my mother, loved to cook. My mother was sweet outside of the kitchen but with an apron around her waist she was the most stringent guru. Her fiery temper made me a competent chef. My father took his eating seriously. If his phone rang while he ate, he answered only to unleash a torrent of insults at the caller. On most nights I swallowed all apprehension about Italian with my food. 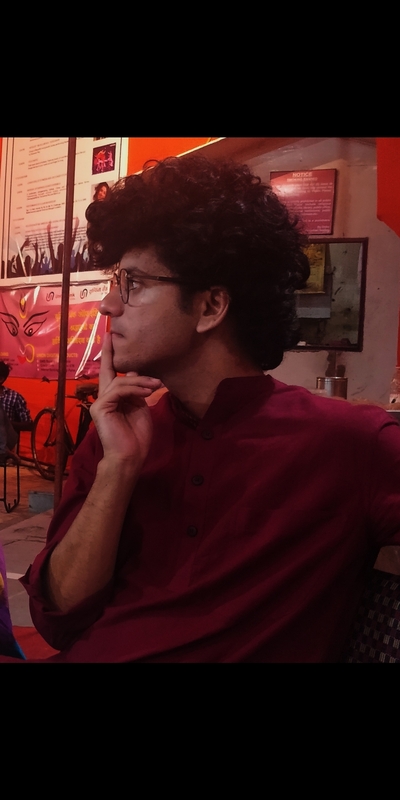 I knew he would never let me leave classes at the Centre because, sometimes, in the dinners of dal makhani, rajma, and curd, which I prepared myself, he would slip in the condiment of an Italian phrase. “Are your classes going well,” he would ask in Italian. I would stare at him. If I ever got a hold of the language I was to serve him a ceremonial bowl of spaghetti carbonara. But whenever my Italian teacher stood me up in class and I had nothing to say, I knew the day would never come. We continued parroting the numbers. Not all at the Centre were uninterested in Italian. Zahra was sitting at the front desk with her back straight, hand in the air, jhumkas shimmering as she shouted the numbers. We were not friends but everyone knew she loved Italian. She had often been sighted at the library, with Italian books spread out before her. If others could not answer in class, she leaned in and whispered in their stead. The Centre screened Italian films regularly and she was present for them all, the light flashing across her face, mouth agape as if to consume the sounds and images. Regardless, it was noon when we were dismissed and I hailed an auto-rickshaw to go home. I was thinking of Zahra with a tinge of jealousy when my phone rang. It was my college friend Prakhar. I clicked my tongue: I had forgotten all about his party; it was later that night. I could not decide if I wanted to go. Prakhar was a good friend but unbearable as a drunk. I thought I would make up an excuse later if I decided against going. When I reached home I found my mama, mami, and their six-year-old daughter Archana in the living room. She was an energetic child. Perhaps this was why I found myself trudging up the stairs to my room, with her bouncing up and down ahead of me, pleading to watch television. When my mother told me Archana would be staying with us for three days, I found myself at Prakhar’s party. Everyone was chatting, drink in hand, heads bobbing to music. I was surprised to see Zahra; she was talking with Prakhar. I approached them and she smiled at me. She got a beer and we sat on a sofa-bed which had been opened up for everyone. “What about the Centre itself? Are you having fun?” she asked. We sat in the library, revising what had been taught in class. It was well into the afternoon and our table was next to a window. A beam of sunlight lit Zahra’s face. There were soft, erratic thuds on the window as a wasp buzzed around outside. Several months had passed as we sat together at the library, whispering in Italian to each other. I accompanied Zahra to the films screened at the Centre, too. With her the language seemed less daunting. Even my father seemed less formidable. Most Italian questions asked of me with mouthfuls of aloo and saag were answered to his satisfaction. Even my mother broke into “mera Italy ka tukda,” on seeing my test papers from the Centre come bearing good marks. And when the likes of my relatives came visiting, my father talked of my keen interest in Italian. My mind had shifted from the lectures and presentations at college to the Centre. No longer was I among the otherwise interested sitting at the back of the class. I was with Zahra, up front, my hand raised in the air. While my Italian was ill–formed and broken, the numbers were child’s play. It was all because of Zahra, sitting in front of me, reading in the sunlight, wasp mindlessly thumping on the window. There can be no pretense: I had fallen in love with her. My determination to learn Italian was just an urgency to impress her. I am convinced that Italian words are incantations in disguise because somehow, along the way, she fell in love with me too. In hindsight it seems like our love for each other was only natural, and like all natural things it grew unbeknownst to us, like a sapling tended to everyday till a bud pops into a flower, and all change becomes apparent. But even though we were best friends—despite her giggling when I mispronounced words—I was nervous as we sat at the library. “My father wants me to cook carbonara tonight,” I whispered. While spaghetti carbonara is quite difficult to cook, the cause of my anxiety was what the occasion really meant: my graduation was approaching fast and I was to be initiated into wood trade. But above all, it was because Zahra and I had decided to tell our parents about each other while things were going well. “We should get it over with fast,” Zahra had said. “The problem will only fester if we don’t. They should have the chance to adjust.” The problem being religion. Spaghetti and Parmesan made for a delightful combination for my parents but a Hindu and Muslim were best kept apart. I was lost in thought as we got up to leave the library. She hugged me and kissed me on the cheek. The rickshaw cycled away, bell ringing. Later that night my father, mother, and I sat at the dinner table with a portion of carbonara on our plates. My father, smiling from ear to ear, put a hand on my shoulder. They began eating and my mother beamed at me from across the table, giving me a thumbs-up. I looked at my father just in time to see a noodle being sucked into his still smiling mouth. “Such a worthy cook,” my mother said, with a smile. They continued smiling and resumed eating. I steeled myself. They looked up, still smiling. But I saw the slightest arch in my mother’s brow. She knew something unsavory was to follow. “It’s about the Centre,” I continued. The smiles still clung to their faces but had been knocked askew, like a tilted picture frame after a door is slammed shut. “Thank you,” my mother snapped. The rest of the meal was eaten in silence. Once it was over, I washed my hands and went upstairs to call Zahra. “How did it go,” I asked. In truth I was quite afraid for what was to come. But I refrained from speaking. A few years later, with no one but Prakhar in attendance, Zahra and I got married in court. Our families abandoned us. Her parents disowned her when they realised she had gone against their will. They were well into discussions about marriage with another family when she told them the truth. My father, on the other hand, tried to tempt me out of the ordeal with the bribe of a secure future. Even my mother had stopped speaking with me. It was years before I heard from her again. But alas be it oak, mahogany, spruce, or ebony, furniture could not entice me to leave Zahra. My father would not have me in the company if I married a Muslim, so I packed my bags, walked out of my parents’ home, and into a one bedroom flat; into uncertainty. I worked as a salesman for a small firm and Zahra worked as a content writer. Spending time together only at night, silent, in stuffy heat under a clacking fan, our relationship was maimed. We hardly saw each other, had little money and even lesser time to entertain thoughts of Italy. Italian was decaying in our minds because we had no use for it; there was no room for it in our cramped apartment. Zahra had stopped reading Italian plays too. All we did was work, eat, watch TV in silence, and sleep. We could no longer afford to think about Italy. Going there seemed like a childish idea. But each night as I stared at the fan, with Zahra sleeping next to me, facing away, I thought about how I could improve things. Knowing that Italy was too expensive a pursuit, an idea took shape in my mind: if we could not go to Italy, I would bring it to our one bedroom flat. I would invent a cheaper Italy. I decided to cook us a dinner of spaghetti carbonara. Being on a minuscule budget, I replaced pancetta and guanciale with simple sausage. I filled our flat with candles and borrowed an old music system and candelabra from Prakhar. Zahra and I only had a coffee table, so I threw a sheet over it and put the candelabra on top. From the nearest liquor shop I bought cheap red wine. Once the creamy pasta was on the table and the candles lit I played Italian jazz on the music system and waited for Zahra to return from work. I was going to attempt speaking in Italian for the entire night even though I had not truly mastered it. But it had to be done. Soon enough I heard footsteps outside. The door opened and Zahra stood in the frame, assessing what was happening. She walked towards the table, with a smile. I pulled out her chair. I unveiled the carbonara and she clutched my hand. I heaped a good portion of the spaghetti onto her plate and poured the wine. She picked up the fork, prodded the food around, and laughed. We ate our dinner with the music playing and talked as the candle flames flickered around us. It was quite hot and we had to switch on the fan and lights soon enough. Zahra and I laughed together, and as she held my clammy palm all felt right again. We made love that night after ages and I woke up the next morning feeling like a richer man. Such a success was the venture that we dedicated all Friday nights to Italy: Italian Night. On Italian Night, of course, there was only Italian to be spoken. The food too was never ordered; I cooked it at home. I added lasagna, cannoli, ravioli, and others to the cuisine of our one-bedroom Italy. If the day at work was forgiving we had energy enough to waltz to Italian music too. Sometimes, if I spent a week persuading her, we watched The Godfather on her laptop. But we enacted scenes from Zahra’s favorite Italian plays more often. She would take her favorite lines from Pirandello’s plays and scribble them in Italian because we only had them in English. Then we would jump onto our bed and shout out the dialogues, sometimes to our neighbors’ dismay. One night, while we were in bed, I heard Zahra sigh and turn toward me. There was silence as I took this in. We were indeed improving: the fridge was full of food and the mind empty of anxiety. But why put it all at risk? As I thought about it, I remember wondering what I was most excited about that week. All I could think of was spaghetti carbonara. Italian Night. I had come to think of spaghetti carbonara as an old friend. The kitchen was bustling as usual and I was cooking carbonara, my face hot from the day spent in front of the stove, my old backache stinging. Regardless, in the boiling water, the raw spoke-like spaghetti had curled into noodles, and I had already beaten the egg yolks with salt, pepper, and grated Parmesan, into a creamy yellow concoction. I cooked the pasta with sausage and turned off the heat. Soon, I added the creamy sauce to the pasta and put it all into the crockery. An Italian man had placed the order. He was not the first Italian in our restaurant, and I knew what would happen. I folded my arms and waited. Soon a waiter came into the kitchen, smiling. I walked out the swinging doors and into the restaurant. It was full and there was a queue outside. Chet Baker’s Romas was playing; a fine choice. I walked towards the Italian man, passing all the posters of Italian architecture, Pirandello, and of course, The Godfather. Zahra and I had hung those posters ourselves when we opened the restaurant. 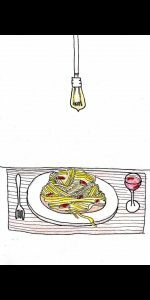 The Italian was sitting alone at a table for two, right next to a wall; a bright yellow filament bulb was hanging above him. His meal was untouched. “I am a chef too,” he said, “from Roma. We are mad for carbonara. So when I saw this on the menu,” he gestured to the food, “Zahra’s Carbonara, I was intrigued. “It would have been my pleasure, Sir. But when I go to Italy now I feel like I have left it behind. I don’t think I can go there without my wife. “Allow me, Sir.” I served him the carbonara. He twirled his fork in the noodles and brought them to his mouth. Looking up at the bulb, he chewed with a thoughtful countenance, and swallowed. Sidharth Singh is a postgraduate student of English literature at Shiv Nadar University. He was a participant at the DumPukht Writers’ Workshop. This is his first publication.